It comes in a sturdy pencil type packaging where one end is the eyeliner and the other end has the smudger brush , with caps enclosing both the ends.I prefer the retractable packaging of the liner pencil any day since there will be no loss of product due to sharpening, but still this is not bad either.The name Bourjois Paris Smoky Khol is printed on the pencil with the shade name indicated near the tip. The color of the outer casing is according to the color of the eye pencil which is helpful when you to have to pick up a particular shade from your collection. The smudger brush is designed using natural fibers and it works well when we try to smudge the liner immediately after application, without letting it dry too much.The bristles are extremely soft and do not cause any harm to the skin during usage, but sometimes I find the creamy liner tends to stick to the bristles while smudging - I need to go over with another coat of the liner in such situations. 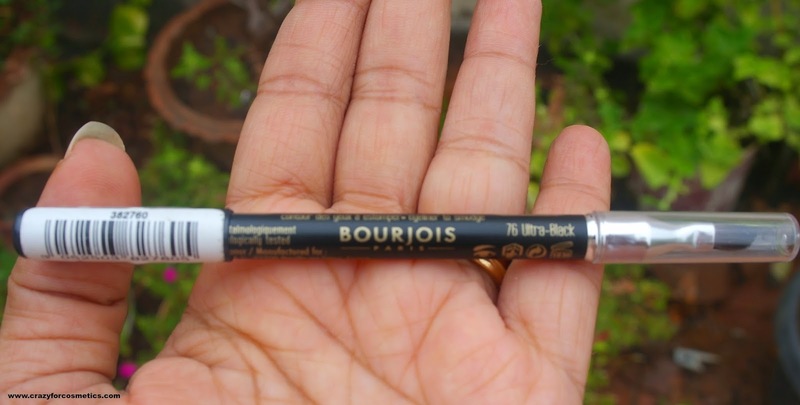 The Bourjois Paris Smoky Khol is extremely creamy and smooth to apply both as a kajal and a liner on the eyelid. 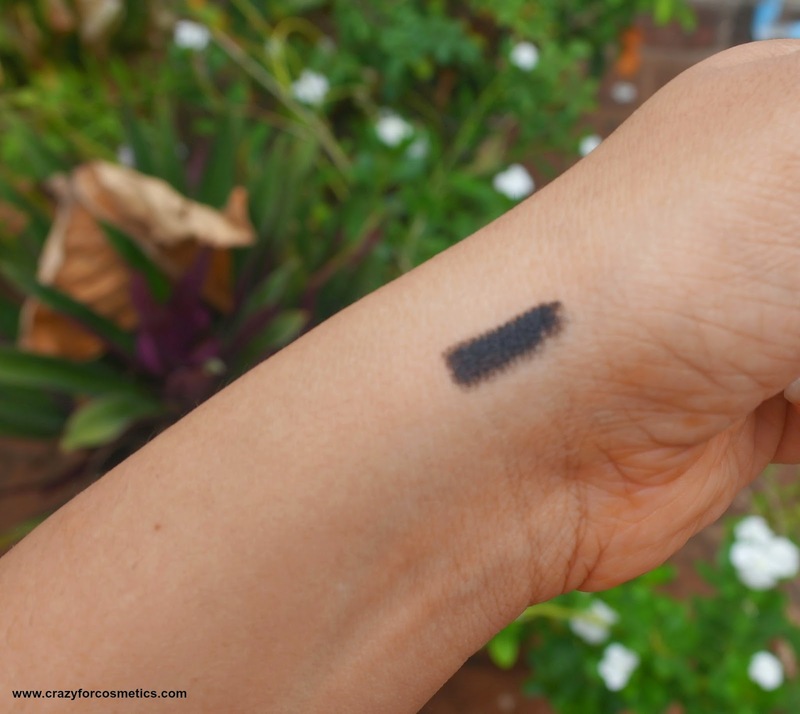 It glides gently on the skin and minimal effort is sufficient to apply the liner evenly. 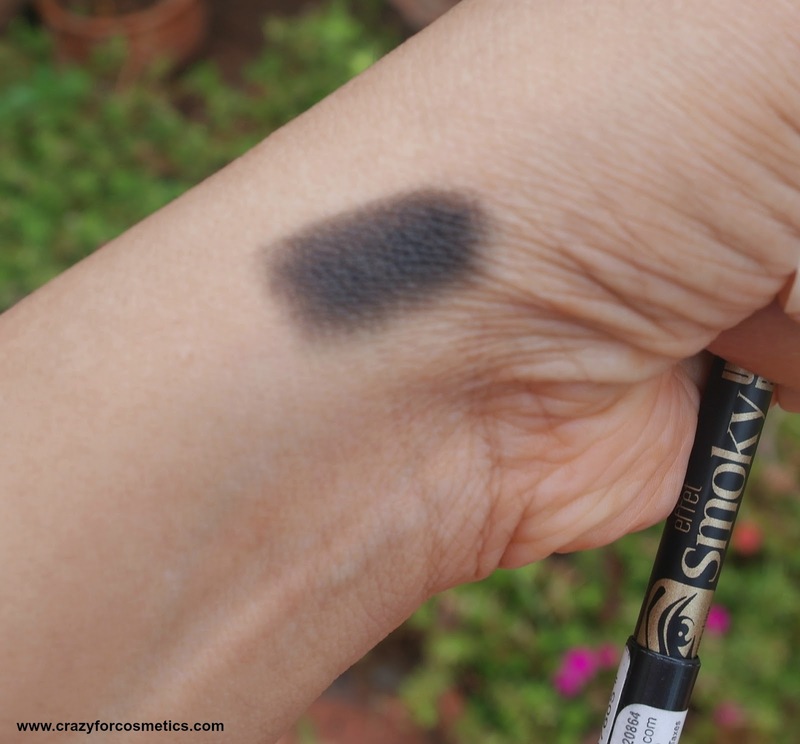 Sometimes when I touch my eyes, the product tends to come off due to the extreme creamy nature.The Bourjois Paris Smoky Khol in Ultra Black is a deep matte black color and can be used safely on the lower lash line. 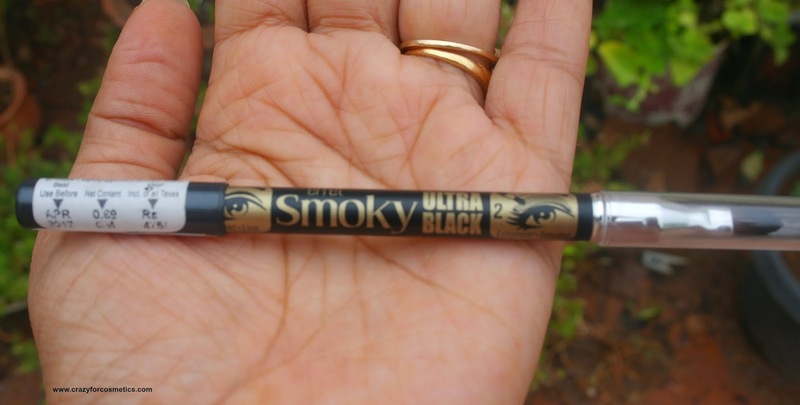 It does not irritate the eyes even a bit and I recommend it as a good long wear kajal pencil. Most of the SA's at the counters usually give us the Shade Noir Expert instead of black but this time I made sure they gave me black. 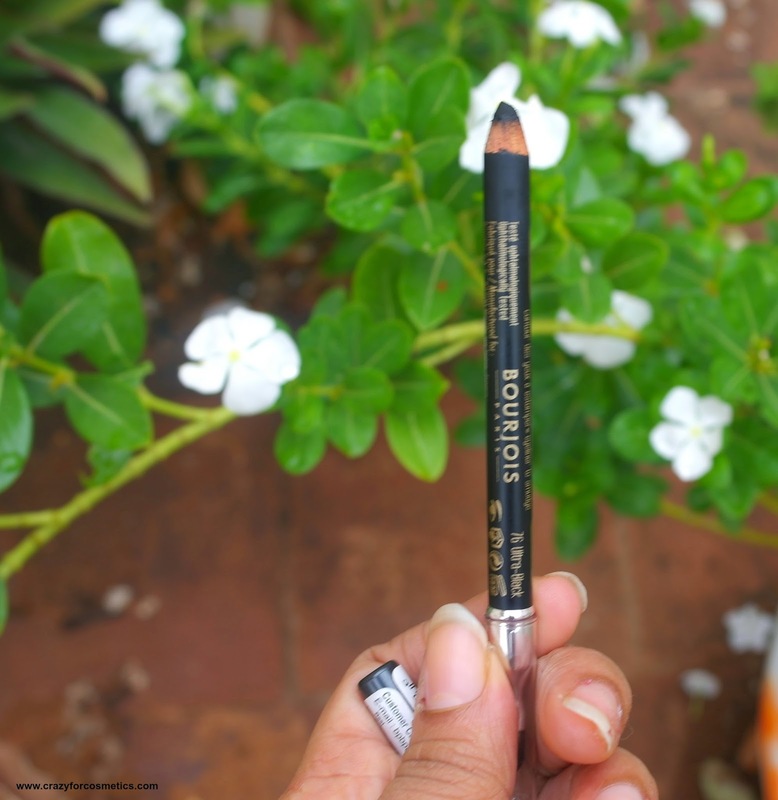 The average staying power of the Bourjois Paris Smoky Khol is 4 to 5 hours without smudging which is really impressive considering how creamy the product is. I apply face powder around the eyelids after I finish applying eyeliner & khol to prevent oily eyelids which leads to creasing of the eyeliner. If you have time for elaborate makeup, you can smudge some matte black eye shadow on top of the liner to make it last longer for about 7 to 8 hours. Another use of the Bourjois Paris Smoky Khol is to act as a good eye shadow binding base when you wanna rock a dark smoky eye look. Wearing blue or plum or brown smoky eye ?? - Do try the Bourjois Khol in Ultra Black as a base for an intense color payoff. 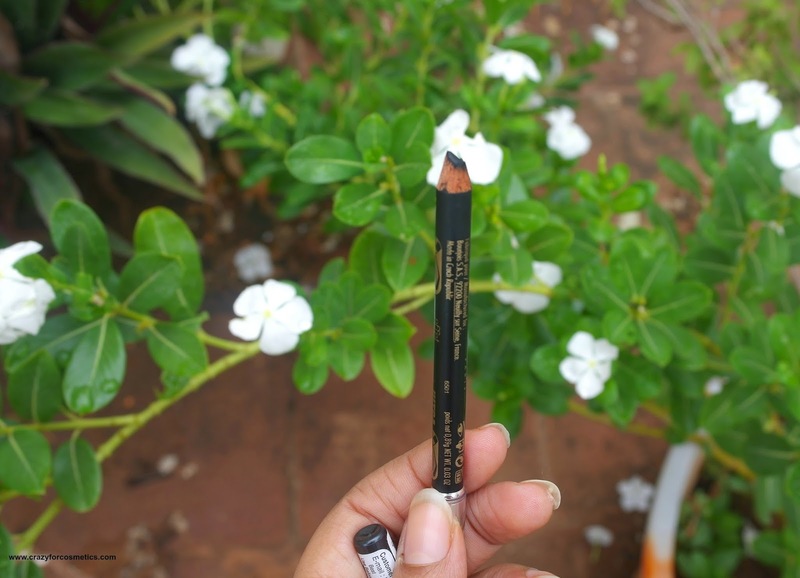 The eyeliner pencil can sometimes break while sharpening, which can be a big big let down due to wastage of product. Those with oily eyelids have to be a bit careful about using this product on your upper lash line as a liner because it can smudge onto your crease area after few hours - either make sure you apply some talcum powder every now & then on your eyelids to prevent oil secretion or clean up the creasing of the eye pencil. Do not miss my Bourjois Paris Haul post here. 1 : Does not irritate the eyes when used on the lower lashline. 2 : Does not smudge for 4 to 5 hours. 3 : The smudger brush is extremely soft and works easily on the tender eye area. 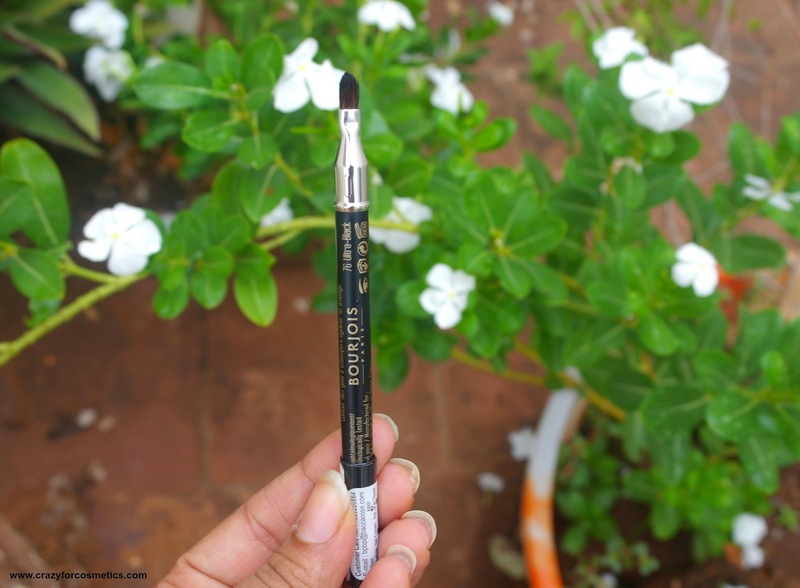 4 : Multipurpose product - works as a liner, kajal & eyeshadow base. 5 : Blackest of Black shade. 1 : Most of the product tends to get tugged onto the bristles of the smudger brush. 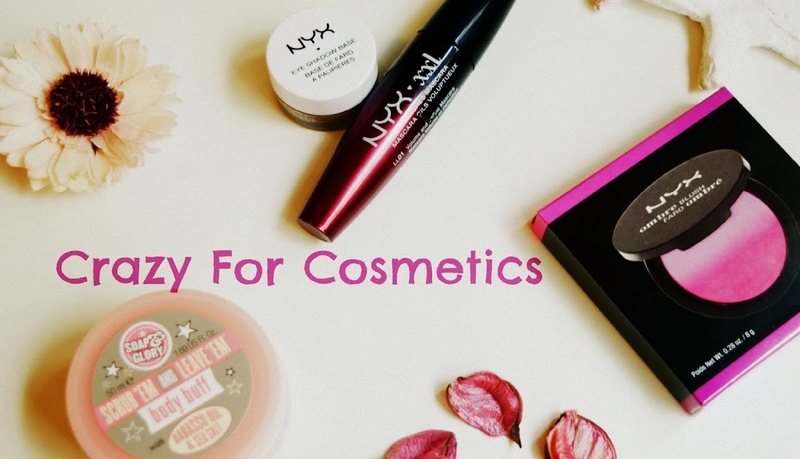 2 : The product is too creamy that sometimes when you touch your eyes , it comes off.